Eureka Seven, known in Japan as Psalms of Planets Eureka Seven (Japanese: 交響詩篇エウレカセブン, Hepburn: Kōkyōshihen Eureka Sebun, lit. "Symphonic Psalms Eureka Seven"), is a 2005 Japanese anime series created by Bones. The series was directed by Tomoki Kyoda, with series composition by Dai Satō and music by Naoki Satō. Eureka Seven tells the story of Renton Thurston and the outlaw group Gekkostate, his relationship with the enigmatic mecha pilot Eureka, and the mystery of the Coralians. The fifty episode series premiered in Japan on MBS between April 17, 2005 and April 2, 2006 and was subsequently licensed by Funimation in North America, Madman Entertainment in Australia and New Zealand and by Anime Limited in the United Kingdom for English home video releases. The series spawned six manga adaptations, a light novel, three video games and a feature-length anime film which was released in Japan on April 25, 2009. One of the manga titled Eureka Seven: AO which was serialized in Shōnen Ace between January 2012 and October 2013, was further adapted into an anime series which aired twenty-four episodes in Japan between April 13 and November 20, 2012. Eureka Seven was well received by critics and earned several awards at numerous award shows in Japan, most notably the 2006 Tokyo International Anime Fair. The Command Cluster is a large concentration of the Scub Coral which acts as the central mind for the rest of its "body". It stores all the information the Scub has collected over the last 10,000 years, and keeps the rest of the Scub Coral in a dormant state. A Kute-class is massive sphere of concentrated energy that materializes suddenly in the skies. Though it is a rare natural occurrence, they can be artificially triggered by causing heavy damage to the Scub Coral. The disappearance of a Kute causes a massive release of energy, ravaging the surrounding landscape and lowering the Trapar count in the area to almost non-existent levels. Antibody Coralians are, as the name suggests, creatures created by the Scub Coral to destroy anything nearby that might be causing it harm. They are unleashed in massive swarms through a Kute-class Coralian when the Scub Coral is threatened or attacked. These antibodies can range in size from as small as a wheelbarrow, or as large as a bomber plane. Their shapes vary wildly, from eyeballs to flying slugs to giant hovering flower-like objects. Most forms are based on the sea creatures they absorbed when they just started their 'growth'. Their powers are: sending lasers in profusion from their bodies, thus being able to destroy large aircraft, burrowing into a victim's body and imploding it (unconfirmed), and creating a spherical void, which makes anything within its surface area to vanish. Antibody Coralians generally appear in response to deliberate attacks on the Scub Coral. They appear for 1246 seconds (20 minutes 46 seconds) - which is the amount of time the Seven Swell phenomenon is active. After those 1246 seconds, they crumble to dust. Their appearances are that of basic invertebrates such as flat worms, mollusks, and cnidaria. One of each kind appears in Another Century's Episode 3: The Final and Super Robot Wars Z.
Human-form Coralians are beings created by the Scub Coral in the form of humans. They are regarded by scientists as emissaries of the Scub Coral, sent to learn about humanity. Humans have attempted to create their own artificial human-form Coralians, but the results are often less than satisfactory. As shown with Eureka in the sequel series, human-form Coralians are biologically capable of reproducing the same way as humans do; she gave birth to a daughter and son. However, due to her children being Human-Coralian hybrids, the high level of Trapar would be too dangerous for them. In Eureka Seven, as a result of the Scub Coral covering the planet, the atmosphere is permeated by an enigmatic energy known as Transparence Light Particles (トランサパランス・ライト・パーティクル, Toransaparansu Raito Pātikuru), dubbed Trapar (トラパー, Torapā) waves for short. Norbu, the Vodarac leader, states that all thought carries with it energy. As a result, a sentient life form on the scale of the Scub Coral produces a tremendous amount of energy. The most important use of Trapar energy is its use as a method of propulsion for flight-capable vehicles. Though Trapar-propelled airships are relatively common, using Trapar waves for "lifting" (リフティング, Rifutingu, or "reffing", according to some fan translations, as well as official translations in some countries) is their predominant use. Lifting uses surfboard-like devices called "reflection boards" ("ref boards" (リフボード, Rifubōdo) for short) to ride Trapar waves in a manner similar to surfing, and is a popular sport in the series. The most grandiose use of Trapar—massive humanoid fightercraft—are a recent development, made possible by the discovery of bizarre alien life-forms within the Scub Coral. The series focuses on Renton Thurston, the fourteen-year-old son of Adrock Thurston, a military researcher who died saving the world. He lives what he considers a boring life with his grandfather in a boring town. He loves lifting, a sport similar to surfing but with trapar, a substance abundant throughout the air, as the medium. He dreams of joining the renegade group Gekkostate, led by his idol Holland Novak, a legendary lifter. An opportunity to do so literally falls into his lap when a large mechanical robot, called the Nirvash type ZERO, and Eureka, its pilot and a member of Gekkostate, crash into Renton's room. Renton's grandfather orders him to deliver a special part to the Nirvash called the "Amita Drive", which releases the immense power dormant within the type ZERO called the "Seven Swell Phenomenon". Afterwards, Renton is invited to join Gekkostate, where he quickly discovers that the behind-the-scenes life of Gekkostate is hardly as glamorous or as interesting as printed in the glossy pages of their magazine, ray=out. Only one thing makes it all worthwhile for him: the presence of Eureka, the mysterious pilot of the Nirvash. Renton, Eureka, and the Gekkostate embark on an adventure that will shape their future as well as the world's. The series was made by Bones and co-produced by Bandai Entertainment. Bandai Entertainment provided the title and handled the creative aspects of the series. Bandai had originally proposed a mecha anime series to the animation studio Bones. The studio had initially rejected it, but later reversed its position because it had already planned to create an anime using mecha designs by Shoji Kawamori. With the appointment of director Tomoki Kyoda and writer Dai Satō, Bandai's proposal was more or less scrapped and the staff began work on their own series that would become Eureka Seven. While conceptualizing Eureka Seven, Kyoda "wanted something that reflected the music and the subculture of his generation—and a love story." As such the show contains several references from music of the 1980s and the 1990s, and almost all of the show's episodes are named after real songs, composed by both Japanese and foreign artists. The director wished to design the series as one that would at first focus on the personal elements and conflicts of the characters, then subsequently move the framework into a broader scale and perspective. The series' two halves each have their own very clear focus that reflects this design choice. With the premise of the surfer robots in mind, Satō interviewed several real-life surfers and came to conclusion that they are close to nature. From this perception, he envisioned the environmental thematic as central point of the story. He said "I thought it might be an effective message for children, especially in Japan. It's pretty veiled. I didn't want to be preachy." Eureka Seven consists of fifty episodes which aired from April 17, 2005, to April 2, 2006, on the Mainichi Broadcasting System and Tokyo Broadcasting System networks. Eureka Seven was available for online viewing on the Adult Swim Fix, Adult Swim's online video service before its televised debut on the Adult Swim channel between April 15, 2006, and ended on April 28, 2007. Adult Swim traditionally cut down the opening and ending themes from each episode to fit the series to American television's time restraints, which resulted in the final episode's first airing having actual content cut from it as the episode originally had no theme song sequences; it was re-aired properly the following week. In Canada, Eureka Seven premiered on YTV's Bionix block on September 8, 2006. Bandai Entertainment and its affiliates distributed the English version of Eureka Seven. It was released in the United States and Canada by Bandai Visual USA, in the United Kingdom by Beez Entertainment, and in Australia by Madman Entertainment. The first translated Region 1 DVD volume of the series was released on April 25, 2006 in the US, while the European Region 2 version was released on September 25, 2006. The English version was produced by Bang Zoom! Entertainment in Burbank, California. Following the 2012 closure of Bandai Entertainment, Funimation acquired the rights to the TV series and re-released the series on Blu-ray and DVD in 2014. An anime sequel titled Eureka Seven: AO began airing on April 12, 2012, and ended on November 20, 2012. There is a total of 24 episodes. It has been released in Japan on Blu-ray and DVD, along with an OVA titled "The Flower Fields of Jungfrau". On May 16, 2013, Funimation announced the official release date in English dub. The first twelve dubbed episodes were released on DVD/Blu-ray on August 13, 2013, and the rest of the series released on October 15, 2013. Eureka Seven uses ten pieces of theme music. The opening themes of Eureka Seven are "Days" by Flow (episodes 1-13), "Shōnen Heart" (少年ハート, Shōnen Hāto) by Home Made Kazoku (episodes 14-26), "Taiyō no Mannaka e" (太陽の真ん中へ, "To the Center of the Sun"), by Bivattchee (episodes 27–32, 34–39) and "Sakura" by Nirgilis (episodes 40–49). The ending themes are "Himitsu Kichi" (秘密基地, "Secret Base") by Kozue Takada (episodes 1–13, 26), "Fly Away", by Asami Izawa (episodes 14–25), "Tip Taps Tip", by Halcali (episodes 27–39) and "Canvas", by Coolon (episodes 40–49). The two insert songs are "Storywriter", by Supercar and "Niji" (虹, "Rainbow"), by Denki Groove (episode 50). The soundtrack music is available on three different albums composed by Naoki Satō and a variety of other artists who composed insert songs used in the series. The first and second soundtrack albums were released on November 2, 2005 and April 5, 2006 respectively. 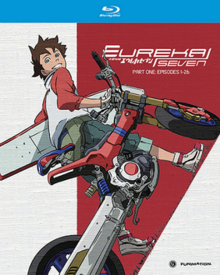 The third soundtrack, titled Eureka Seven: Complete Best include the full-length versions of the opening and ending themes for both the series and game, as well as the insert song for the final episode. The anime adaptation of Eureka Seven: AO uses six pieces of theme music. For the 13 first episodes, the opening theme is "Escape" performed by Hemenway and the ending theme is "stand by me" by Stereopony. Starting with episode 14, the opening theme changes to "Bravelue" (ブレイブルー, Bureiburū) performed by FLOW and the ending theme changes to "Iolite" (アイオライト, Aioraito) performed by joy. The two insert songs are "Parallel Sign" and "Seven Swell", both performed by LAMA. A manga adaptation of the original anime was created by Jinsei Kataoka and Kazuma Kondou. The manga was published by Kadokawa Shoten and began serialization in Monthly Shōnen Ace from the March 2005 issue and ended in the January 2007 issue, with a total of 23 chapters. The chapters were later compiled into six volumes. A second manga titled Eureka Seven: Gravity Boys and Lifting Girl (エウレカセ ブン グラヴィティボーイズ&リフティングガール, Eureka Sebun Guravuiti Bōizu & Rifutingu Gāru) by Miki Kizuki, features the protagonists of the video games New Wave and New Vision. It was published by Kadokawa Shoten and serialized in Comptiq magazine. Two volumes were released in Japan on November 7, 2011 and September 26, 2006 respectively. On December 22, 2011, Kadokawa Shoten's Monthly Shōnen Ace magazine announced that a sequel manga titled Eureka Seven: AO based on the sequel series would be launched in their January 2012 issue. It featured an original story by Bones and was illustrated by Yūichi Katō. The manga began in January 2012, and concluded in October 2013, with a total of 21 chapters spanning over 5 volumes. A spin-off manga called "Eureka Seven AO - Save a Prayer" began shortly after and focuses on a girl name Yuna and her two friends as they make their way from becoming trainees in Generation Bleu's Headquarters. A fifth manga titled "Eureka Seven nAnO" was published as a 4koma and featured characters from the AO series. A sixth manga adaptation titled Psalms of Planets Eureka Seven New Order was serialized in Comptiq by Kadokawa Shoten between January and June 2013. A light novel series written by Tomonori Sugihara and illustrated by Robin Kishiwada, was published by Kadokawa Shoten under their male oriented Sneaker Bunko label. A novelization of the new Eureka Seven film sharing the same name was also written by Tomonori Sugihara and illustrated by Hiroki Kazui and Seiji has also been released in Japan on May 1, 2009. Eureka Seven has three video games, all developed by Bandai or later Namco Bandai Games. The first to be released was Eureka Seven Vol. 1: The New Wave (エウレカセブン TR1:NEW WAVE, Eureka sebun TR1: Nyū uēbu), which was released in Japan on October 27, 2005, and in North America on October 24, 2006. The game features a different cast of characters and takes place two years before the anime. A sequel, Eureka Seven Vol. 2: The New Vision (エウレカセブン NEW VISION, Eureka sebun nyū bijon), was released in Japan on May 11, 2006 and in North America on April 17, 2007. New Vision takes place two years after the events of New Wave. Both games were released on the PlayStation 2 and feature the theme song "Realize", sung by Flow. A PlayStation Portable game sharing the same name of the anime, was released on April 6, 2006, in Japan. This game is based on the events from the first half of the show. A theatrical adaptation, Eureka Seven: Good Night, Sleep Tight, Young Lovers (Japanese: 交響詩篇エウレカセブン ポケットが虹でいっぱい, Hepburn: Kōkyōshihen Eureka Sebun: Poketto ga Niji de Ippai, subtitle literally "Pocketful of Rainbows"), was first announced in the May 2008 issue of Newtype; it was publicly released on April 25, 2009, during Golden Week, with the animation production handled by Kinema Citrus. It contained a new mythos in an alternative universe, despite still featuring Renton and Eureka as the main characters, and confirming the events of the original series happened in a parallel world. Good Night, Sleep Tight, Young Lovers screened at select theaters nationwide in the US for a one night only special event on September 24, 2009 courtesy of Fathom Events. The movie also played at the Fantasia festival in Montreal on July 28, 2009. The main theme song for the film is "Space Rock", by iLL.
A second three-part theatrical adaptation, Psalm of Planets Eureka Seven: Hi-Evolution (交響詩篇エウレカセブン ハイエボリューション, Kōkyōshihen Eureka Sebun: Haieboryūshon), was announced on March 17, 2017, with the first movie released on September 16, 2017. The film trilogy takes place before and during the events of the original series, as well as having an original story. The second film was released on November 10, 2018 under the title Anemone: Psalm of Planets Eureka Seven: Hi-Evolution (ANEMONE／交響詩篇エウレカセブン ハイエボリューション, Anemone: Kōkyōshihen Eureka Sebun: Haieboryūshon). At Anime Boston, Masahiko Minami confirmed that the first film of the trilogy will premiere in Japan, the United States, the United Kingdom, France, Australia, Singapore, Malaysia, Indonesia, and Thailand in Fall 2017, and that Funimation will distribute the film in the United States. Madman Entertainment will distribute the film in Australia and New Zealand. Anime Limited will distribute the film in the UK. Odex later announced they will distribute the film in Southeast Asian territories. Towards the end of its original Japanese run, Eureka Seven won multiple awards at the 2006 Tokyo International Anime Fair, including Best Television Series, Best Screenplay for Dai Satō, and Best Character Designs for Kenichi Yoshida. Yoshida, the series' main animator and character designer, also received an individual award at the 10th Animation Kobe Awards in September 2005. The series also won an award at the 20th Digital Content Grand Prix in Japan in January 2006. At the Anime Expo 2006 SPJA Awards, Eureka Seven won the award for Best Television Series, and Best Female Character for Eureka. Anime Insider voted it "Best DVD Series of the Year" in 2006. During a conference in 2010, writer Dai Satō claimed that many anime fans dismissed Eureka Seven as a clone of Neon Genesis Evangelion without even watching it. The sequel series, Eureka Seven: AO, was met with mixed-to-negative reviews from fans and critics, who criticized the series for being a contradiction to Eureka Seven. It was however awarded the jury selection prize by the 17th Japan Media Arts Festival Awards. ^ "Eureka Seven Complete Collection". Madman Entertainment. Archived from the original on January 21, 2018. Retrieved January 21, 2018. ^ Santos, Carlo (January 1, 2007). "Eureka 7 DVD 4 - Review". Anime News Network. Retrieved July 28, 2017. ^ INCENDIARYLEMON (November 20, 2017). "Eureka Seven Review". Anime UK News. Retrieved March 10, 2019. ^ "Bandai Co-Producing Eureka 7". Anime News Network. Retrieved 2012-02-02. ^ Shida, Hidekuni (March 2006). "Eureka Seven: Catch the wave". Newtype USA. 5 (3): 46. ^ a b c Sato, Dai (2005-11-29). "Dai Sato talks with Doug McGray about anime" (PDF). Japan Society (Interview). Interviewed by Doug McGray. New York. Archived from the original (PDF) on 2015-02-26. ^ "Eureka seveN "alternative soundtrack"". Retrieved 2006-03-20. ^ Kyoda, Tomoki (February 2007). "Eureka Seven: Home at last". Newtype USA. 6 (2): 30–31. ^ "Bandai Entertainment and Crunchyroll to Stream Anime Mecha Series Hit Eureka Seven". AnimeNewsNetwork. August 26, 2009. Retrieved November 24, 2009. ^ "Funimation Licenses Eureka Seven TV Series". Anime News Network. Retrieved 25 November 2013. ^ 交響詩篇エウレカセブン ＯＲＩＧＩＮＡＬ ＳＯＵＮＤＴＲＡＣＫ １ (in Japanese). Jbook. Retrieved 2012-01-31. ^ 交響詩篇エウレカセブン ＯＲＩＧＩＮＡＬ ＳＯＵＮＤＴＲＡＣＫ ２ (in Japanese). Jbook. Retrieved 2012-01-31. ^ 交響詩篇エウレカセブン ＣＯＭＰＬＥＴＥ ＢＥＳＴ【期間生産限定盤：特 製ＢＯＸ仕様他】 (in Japanese). Jbook. Retrieved 2012-01-31. ^ 交響詩篇エウレカセブン　ＣＯＭＰＬＥＴＥ　ＢＥＳＴ (in Japanese). Rakuten. Retrieved 2012-01-31. ^ エウレカセブン グラヴィティボーイズ&リフティングガール(1) (in Japanese). Kadokawa. Archived from the original on 2013-05-23. Retrieved 2012-01-28. ^ エウレカセブン グラヴィティボーイズ&リフティングガール(2) (in Japanese). Kadokawa. Archived from the original on 2013-05-23. Retrieved 2012-01-28. ^ 交響詩篇エウレカセブン ニュー・オーダー」コミックス第1巻 (in Japanese). Eureka Seven AO Official Web Site. 2013. Retrieved 2013-02-10. ^ "Comptiq Magazine Ends 3 Manga With No New Ones in Next Issue" (in Japanese). Anime News Network. 2013. Retrieved 2013-05-13. ^ 交響詩篇エウレカセブン ポケットが虹でいっぱい (in Japanese). Kadokawa. Archived from the original on 2013-05-23. Retrieved 2012-01-28. ^ "Eureka Seven Vol. 1: The New Wave". IGN. Retrieved 2012-01-28. ^ "Eureka Seven Vol. 2: The New Vision". IGN. Retrieved 2012-01-28. ^ "Eureka Seven". IGN. Retrieved 2012-01-31. ^ "Eureka Seven Movie's Title, Release Date Announced". Anime News Network (December 11, 2008). Retrieved on December 11, 2008. ^ At Anime Expo 2009, Bandai announced that it would be releasing the film. "Eureka Seven Movie to be Announced in Newtype Mag". Anime News Network. 2008-04-07. Retrieved 2008-04-07. ^ "Eureka Seven - good night, sleep tight, young lovers". Ncm.com. 2009-09-24. Archived from the original on 2010-01-27. Retrieved 2010-02-21. ^ "The US Debut of Eureka Seven Good Night Sleep Tight Young Lovers Brings a Futuristic Anime Tale of Love and War to Movie Theaters Nationwide in One Night Event" (PDF). NCM. August 31, 2009. Retrieved August 21, 2016. ^ "Eureka Seven Gets Film Trilogy Set a Decade Earlier With New Hardfloor Song". Anime News Network. March 17, 2017. Retrieved March 17, 2017. ^ "1st Film in Eureka Seven Trilogy Opens in 9 Countries Including U.S. This Fall (Updated)". Anime News Network. April 3, 2017. Retrieved April 3, 2017. ^ "Eureka Seven: Hi-Evolution is coming to Australia and New Zealand". Madman. April 3, 2017. Retrieved April 3, 2017. ^ "ANIME LIMITED TO SCREEN 'EUREKA SEVEN: HI-EVOLUTION' MOVIES IN CINEMAS". AlltheAnime. April 5, 2017. Retrieved April 11, 2017. ^ "Tokyo Anime Fair: Award Winners". Anime News Network. 2006. Retrieved 2007-02-15. ^ "10th Animation Kobe Awards". Anime News Network. 2006. Retrieved 2007-09-06. ^ "20th Digital Content Grand Prix". Anime News Network. 2006. Retrieved 2007-09-06. ^ "Eureka Seven Wins 2 SPJA Awards at AX". Anime News Network. 2006. Retrieved 2007-09-06. ^ Anime Insider Best of the Best. Tokyopop blog entry (2006). Retrieved on 2007-04-07. ^ Galbraith, Patrick W. (July 24, 2010). "Storywriter Sato Dai is frustrated with Japanese anime". Otaku2.com. Archived from the original on July 27, 2010. Retrieved March 7, 2011. This page was last edited on 31 March 2019, at 11:17 (UTC).